Fire Muse Circus @ Burning Man The Sheep Fiends perform at the Fire Muse Circus stage (Center Camp and 9:30) in Black Rock city. Gigsville @ Burning Man The Sheep Fiends have a brief performance at the car-b-que in Gigsville (Mercury and 4:00-4:30) in Black Rock City. Infinite Oasis @ Burning Man The Sheep Fiends perform on the Infite Oasis stage (Earth and 4:30) in Black Rock City. Be Excellent Halloween Party Private Party The Sheep Fiends have a frightening reunion. Section X Section X This performance consisted of a 30 minute set of "oldies" performed by Matthew Cramer, David Ladd, Fazal Miles and Brian McNally. This was followed by 2 1/2 hours of intoxicated open jamming which included Jesse Cramer, David Hurst, Greg Winston and numerous audience members. The Hot House The Hot House, 31 E. Balbo, Chicago This LoveChaos project is as much about theatre, vaudeville, performance art, craziness as it is about music. 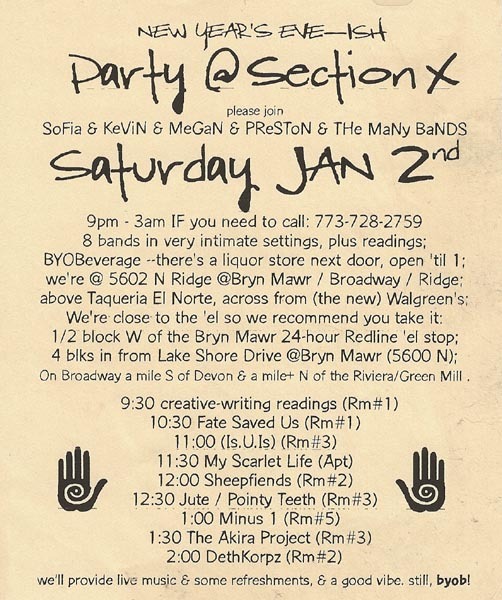 Section X New Millennium Party Section X As the great odometer flips over, The Sheep Fiends celebrate. Burning Man ReCompression Party The Launch Pad See the Burning Man web page for more information. POW! at the Morseland The Morseland, 1218 W. Morse, Chicago Informal background music to a poetry performance hosted by Noam Paco Gaster. POW! 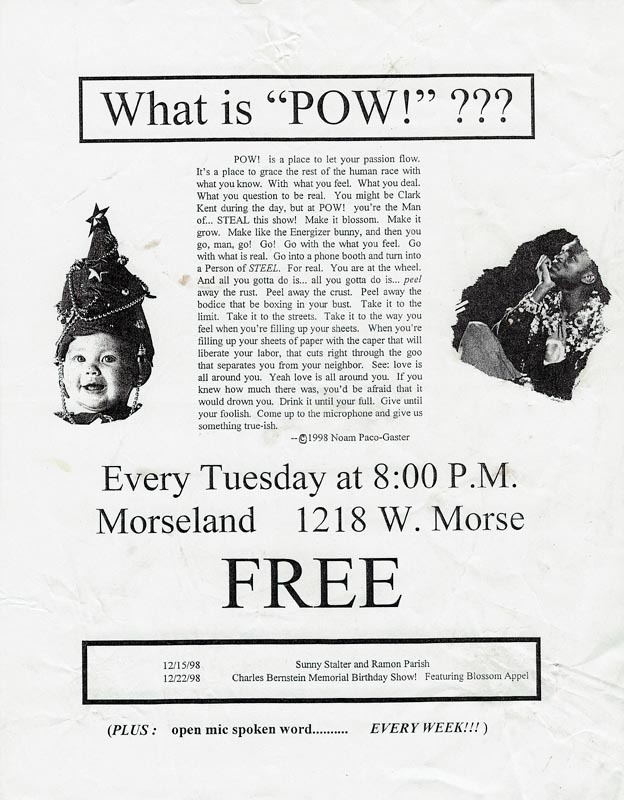 @ Morseland The Morseland, 1218 W. Morse, Chicago POW! music and poetry hosted by Noam Paco Gaster. No cover, 8:30-10pm. 21 and older show. 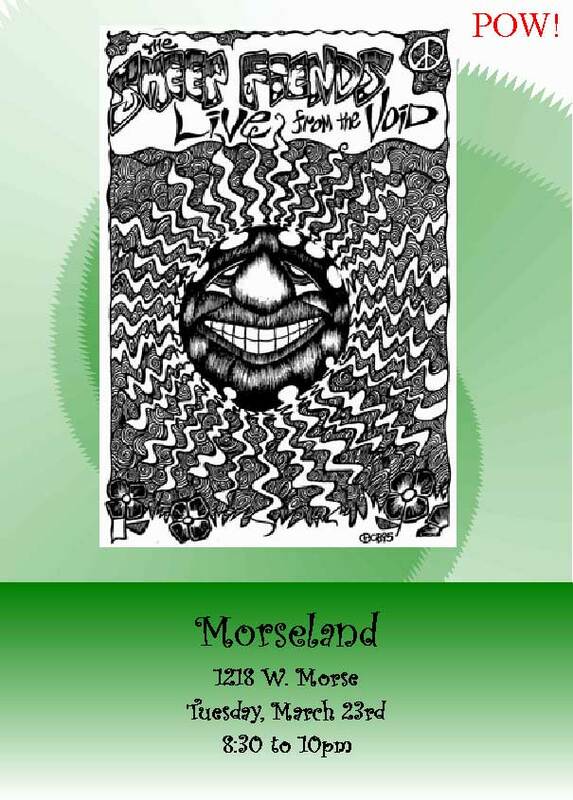 The Sheep Fiends performed with Comedy Central and an evening of poetry and music to celebrate the Morseland's anniversary. DeLonde & Blossom Going Away Party The Launch Pad The Sheep Fiends perform to celebrate DeLonde's and Blossom's upcoming move to Portland, Oregon. We wish them much success! 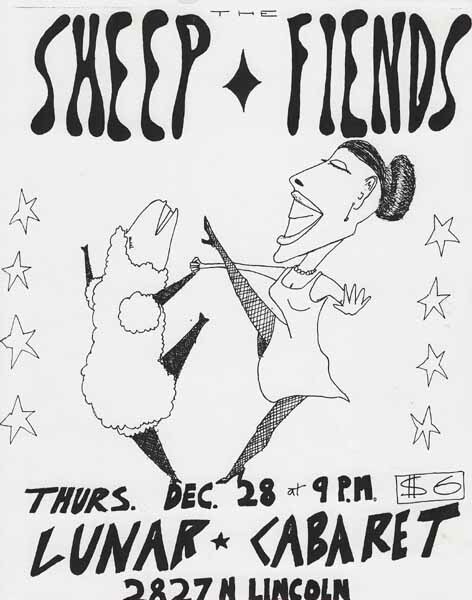 Show is from 9pm to 3am with the Sheep Fiends going on stage at midnight. 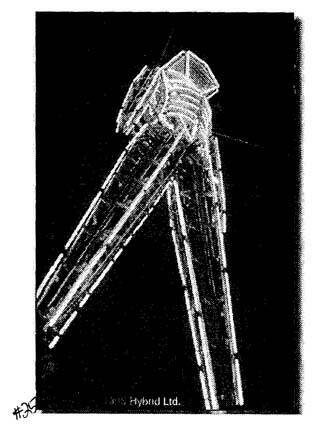 Solo music and poetry by DeLonde, Blossom, Noam Paco Gaster and others will also be featured. 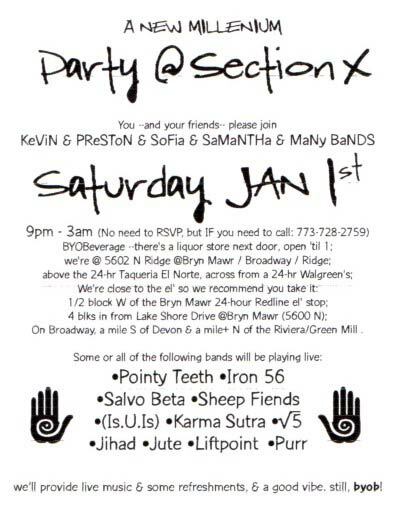 Section X New Years Party Section X The Sheep Fiends perform with My Scarlet Life, Is-U-Is, DethKorpz, Muzloh at the Section X New Years Eve Party. 9pm to 3am. Be Excellent! Productions Halloween Party Genoa, IL The Sheep Fiends are the house band at the 1998 Be Excellent! Productions Halloween Party. Lights provided by Vinay Gupta. PoetSluts III @ Morseland The Morseland, 1218 W. Morse, Chicago Performance from 10:30pm to 1:30am. Cover is $3. 21 and older show. Performance also features Noam Paco Gaster, Tribal Screen Hens, Serena (Blossom) Appel, Karl Sacksteder. 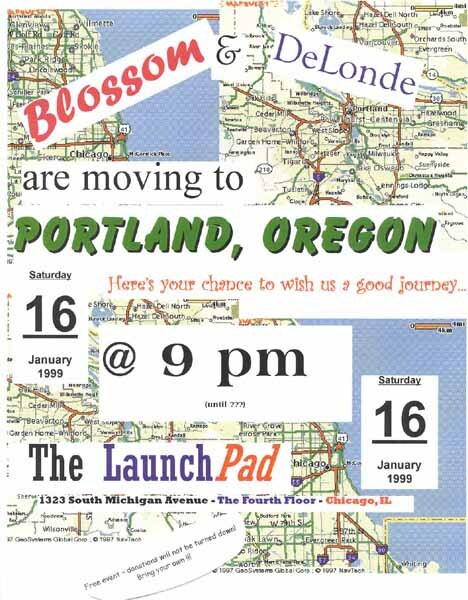 Image (c) 1998 Serena (Blossom) Appel. Chicago Burning Man Decompression Party The Launch Pad See the Burning Man website for more information. Light effects provided by Bill Lonestar. Some folks from the Burning Man party joined in the jam. 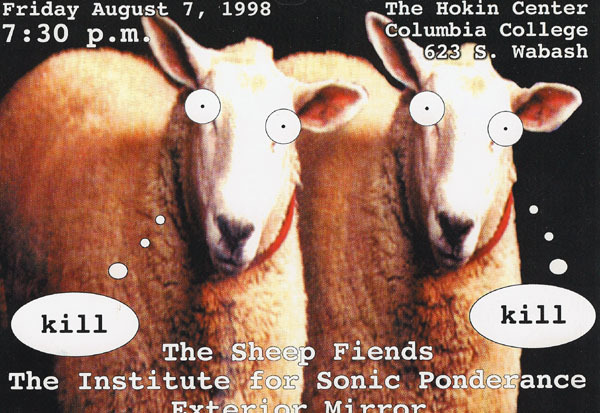 Columbia University The Hokin Center, Columbia University, 625 S. Wabash, Chicago The Sheep Fiends, The Institute of Sonic Ponderance and Exterior Mirror perform from 7:30 to 10pm. 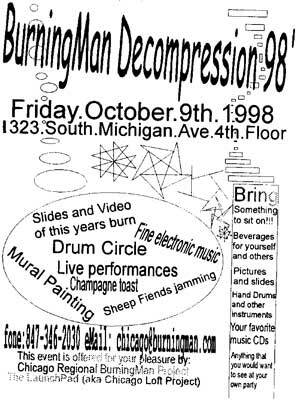 Experimental Music Showcase Urbus Orbis, 1934 W. North Avenue, Chicago A Celebration of Brian Cameron's 28th birthday. 9pm. Section X Halloween Party Section X The Sheep Fiends performed at the Section X Halloween Party! From 9pm to 3am. IsYouIs and Muzloh also performed. 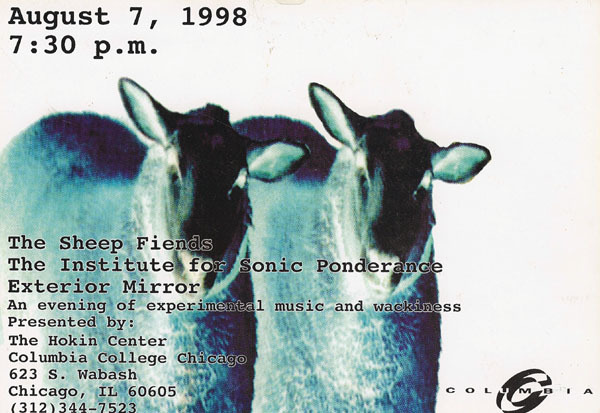 Songsation Performance Channel 19 Public Access Studios, Chicago Two 10-minute segments of live Sheep Fiends performance recorded. The first segment was shown on Sunday, September 21st at 9pm and on Monday, September 22nd at 4pm. The second segment was shown on Sunday, September 28th at 9pm and on Monday, September 29th at 4pm. The television program Songsation appears on Cable Access Network (CAN), cable channel 19 in Chicago only. Two ten-minute segments also recorded by Don't Be Afraid of the Dark Productions featuring Brian Cameron, Mark Cohen, James Gautier, David Ladd, Jules Owsinek and Zoe. Additional sements were recorded by poet Mark Cohen and songs performed by Jules Owsinek and friends. 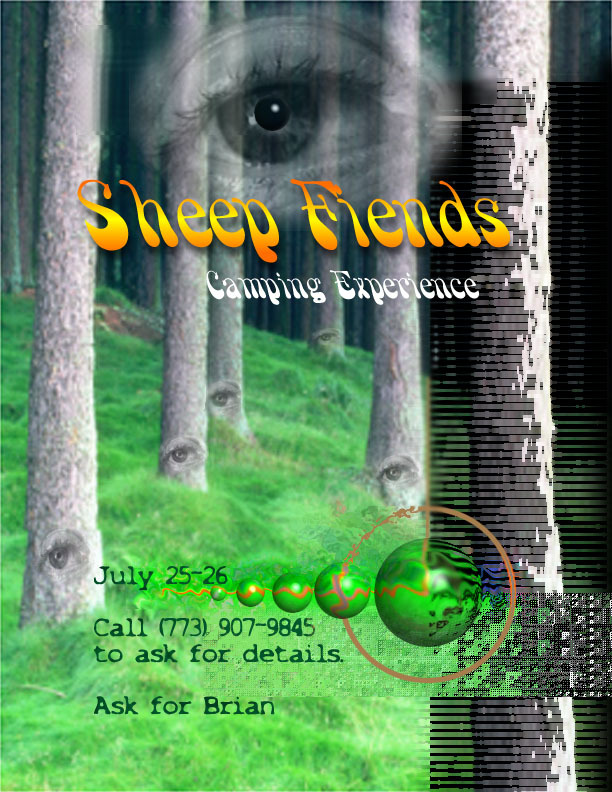 Camping Experience - Day 1 Walcamp, Kingston, IL A celebration of the summer with a two-day camping trip. An electrical performance was held Friday evening from 9-11pm and on Saturday afternoon from noon until 3pm. Water games to help cool off in the heat. Chicago Public Library Studios Chicago Public Library, Chicago One improvisational piece was dedicated to Allen Ginsberg, who passed on just the day before. Recording music at the library is a free public service. Call (312) 747-4896 to schedule time. Afterwords, this trio rehearsed for the next P.O.E.T.S. performance. Skokie Public Library Skokie Public Library, Skokie, IL A musical performance of James Gautier's poetry at the Skokie Public Library. Mark Cohen translated a number of James' poems into sign language. This show was filmed for public-access television broadcast. Noam Paco Gaster and Mark Cohen also read poetry as a part of this performance. Be Excellent! 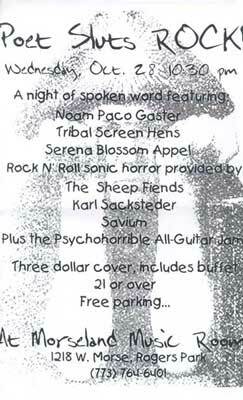 Productions Halloween Party Genoa, IL The Sheep Fiends are the house band at the 1996 Be Excellent! Productions Halloween Party. Lights provided by Larkin and Brian Peterson. 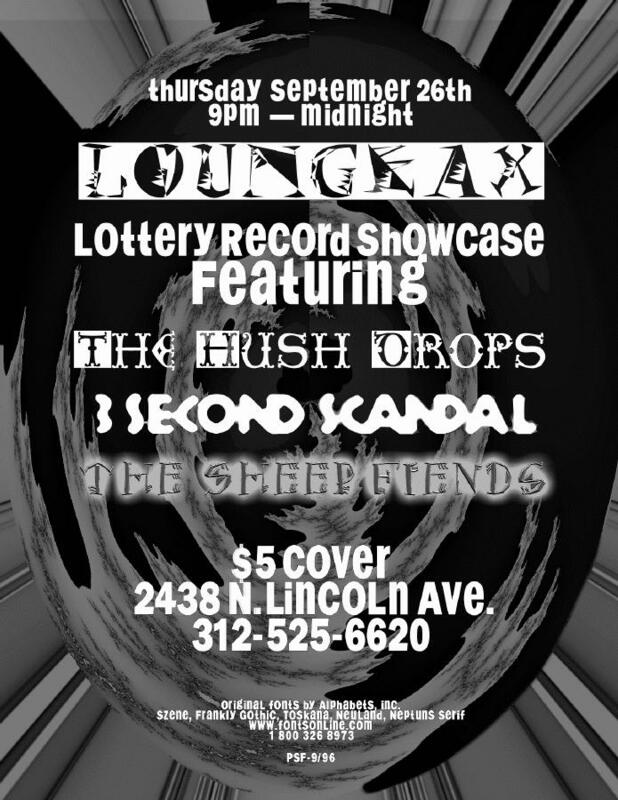 Lottery Record Showcase @ LoungeAx LoungeAx, 2438 N. Lincoln Avenue, Chicago Thax After Dark presents The Sheep Fiends performing with The Hush Drops and 3 Second Scandal from 9pm to midnight. This show occurred at the same time as a full lunar eclipse. Jeremy Young did not perform, but recorded a song backstage. Feelgood Fiasco #10 The Heartland Cafe, 7000 N. Glenwood, Chicago Also featured are Artlab, George the Naughty Angel and Noam Paco Gaster's Curiously Strong Machine Gun Open Mike. 9:30pm. $2 cover. Curt & Jenni Halsted's Wedding Reception Walcamp, Kingston, IL Light show provided by Larkin and Brian Peterson. The Sheep Fiends were joined by many friends who were at the reception. 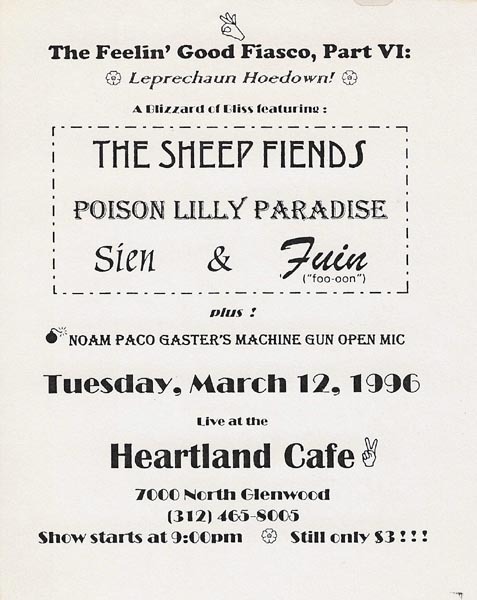 Feelgood Fiasco #6 The Heartland Cafe, 7000 N. Glenwood, Chicago Leprechaun Hoedown! A Blizzard of Bliss also featuring Poison Lilly Paradise, Syen U, Fuin (foo-oon), and Noam Paco Gaster's Machine Gun Open Mike. 9pm. $3 cover. 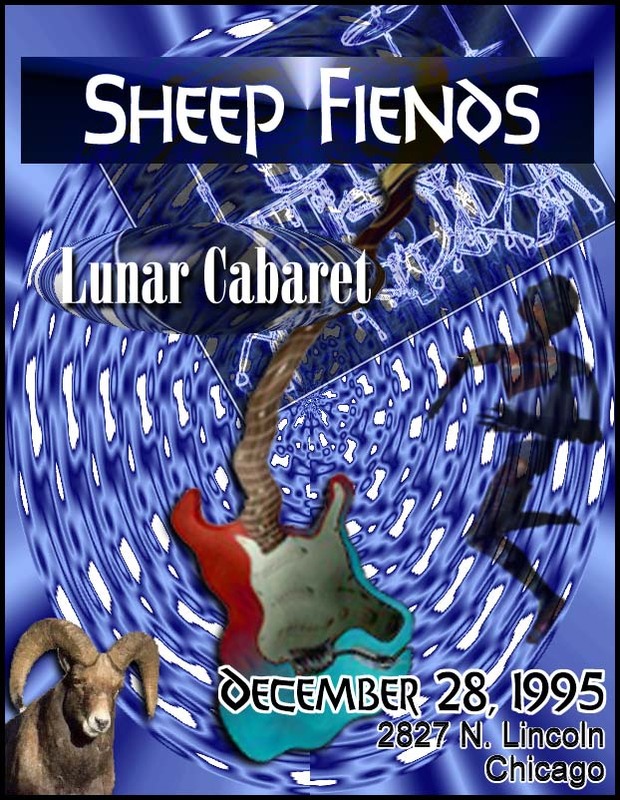 Live at the Moon Lunar Cabaret, 2827 N. Lincoln, Chicago The Sheep Fiends first electric live performance. The musicians take turns at the stage. Show runs from 9:40pm until 12:20am. 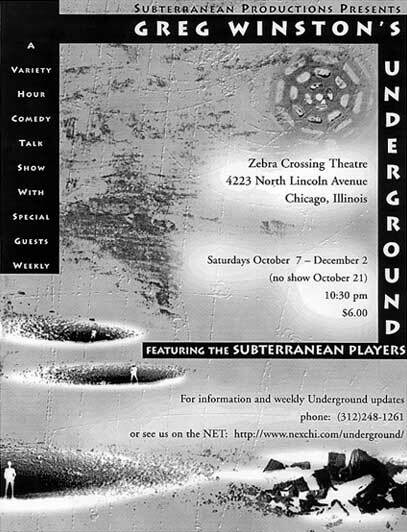 Greg Winston's Underground #1 Zebra Crossing Theatre, 4223 N. Lincoln, Chicago The Sheep Fiends first live performance.